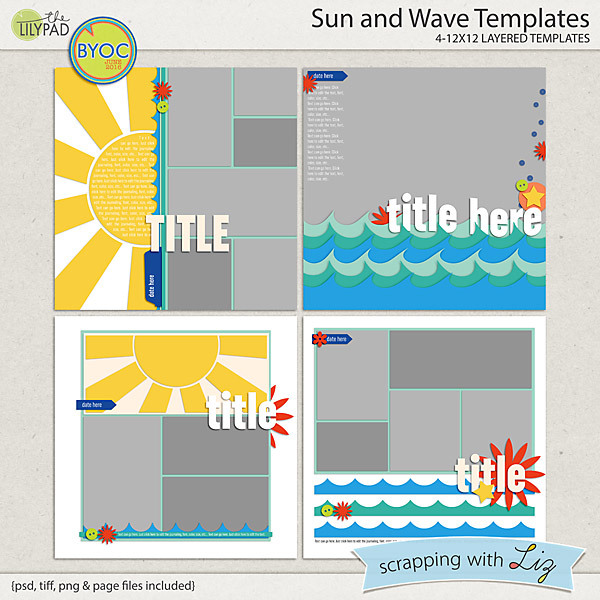 Liz has some great new templates in the Lilypad Store today. 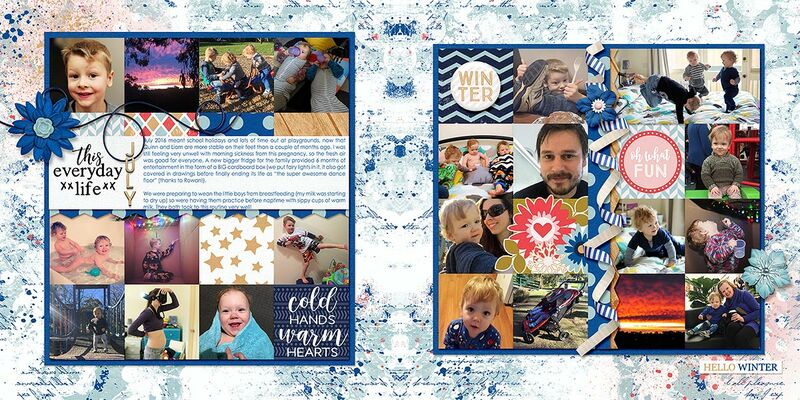 One set is great for patriotic or celebratory pages, and the other is a great stash-building set (perfect for just about any kind of page). They are both 20% off through July 2, 2017. 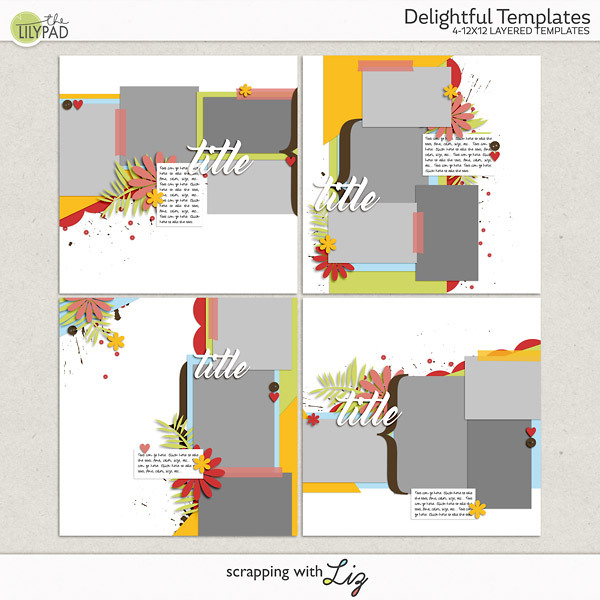 Delightful Templates have 3 or 4 photos spots and some fun angled paper layering in the background. 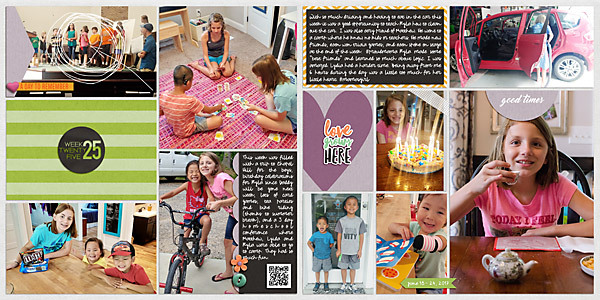 I like how these span the page but don't fill the page - a nice happy medium with good sized photos but not overpowering. 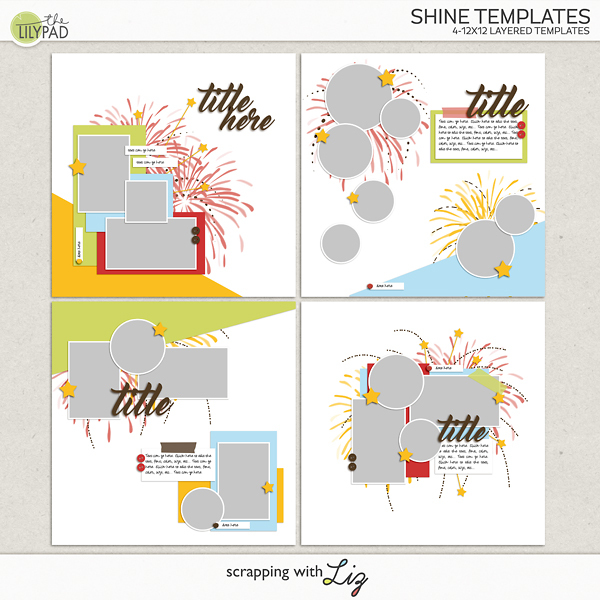 Shine Templates are great for scrapping your patriotic festivities - they have some great fireworks stamps bursting out from behind the photos. 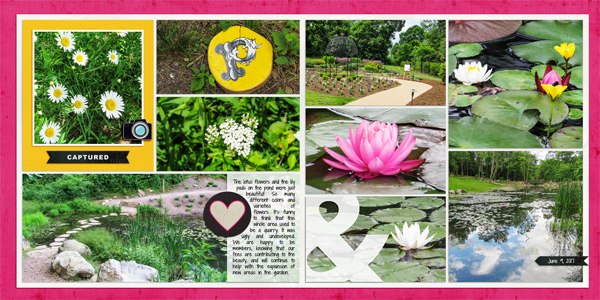 I like the mix of rectangular and circular photo spots. 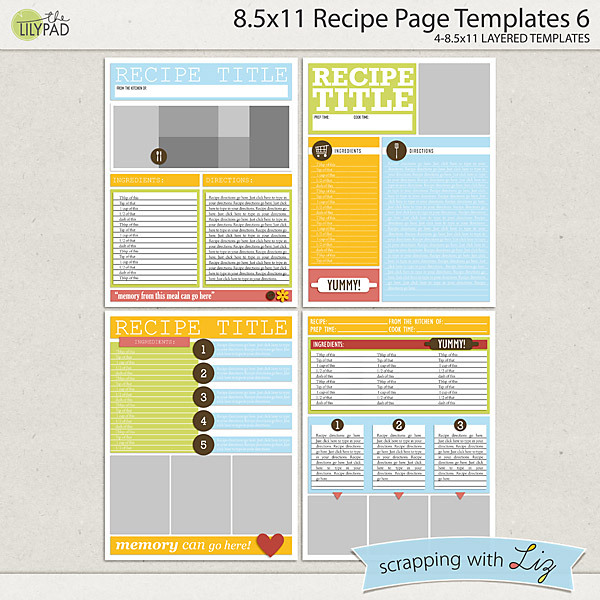 Cynthia scrapped her pets with Delightful Templates. And Stefanie scrapped pets with Shine Templates! Today I Something Old and Something New-ish on sale. 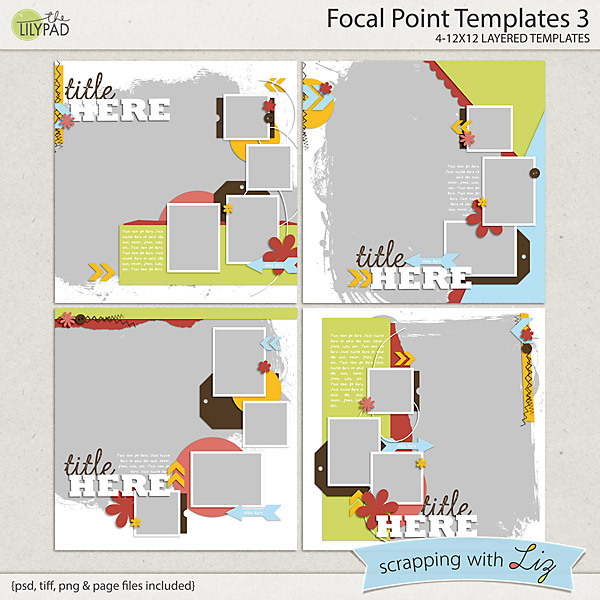 Focal Point Templates 3 is a pack featuring large masked focal photos paired with several smaller supporting photos. 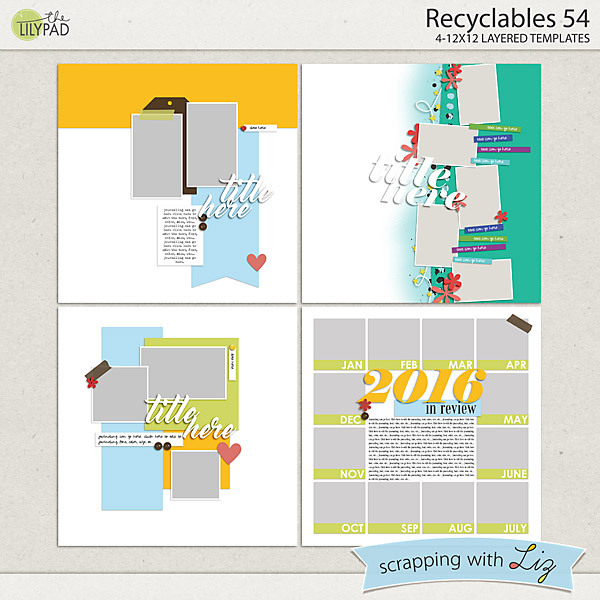 Recyclables 54 is new to the store, but comprises a few past freebies or challenge prizes. 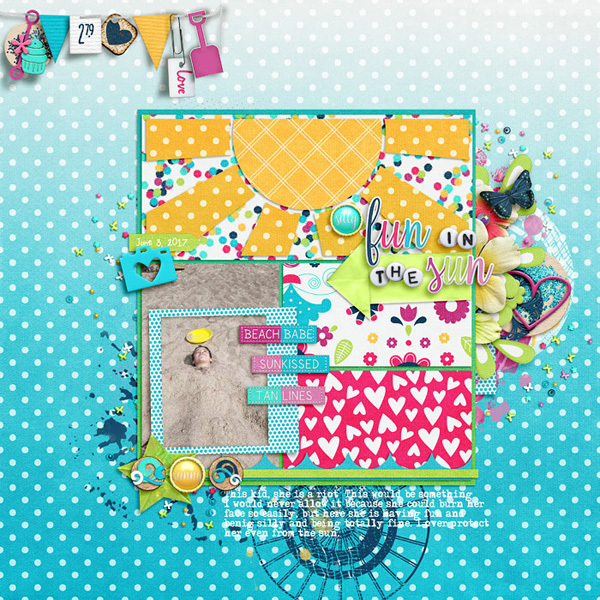 This set has a variety of clean and playful designs. Enjoy the 50% SOSN discount on these products today only, June 28, 2017. 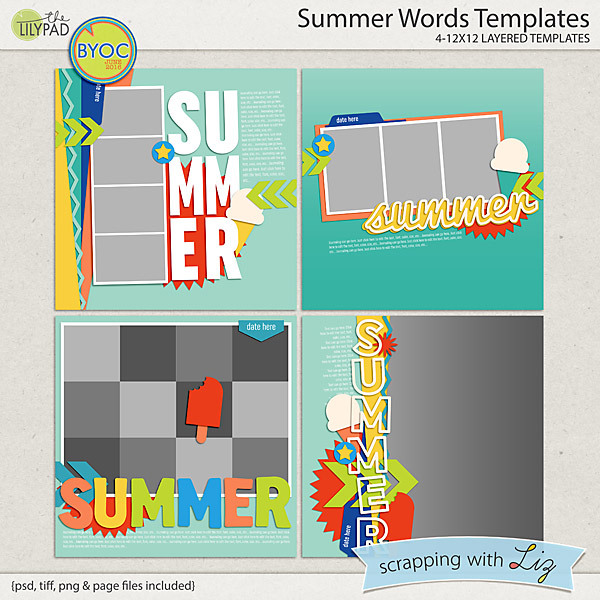 Justine scrapped this page with Recyclables 54. 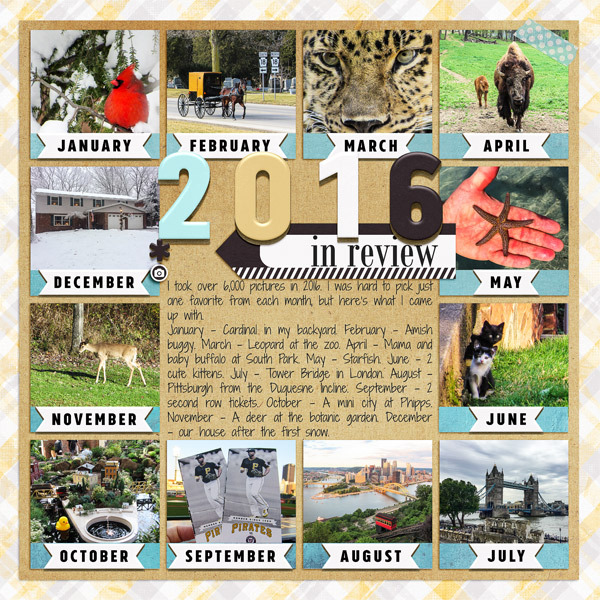 Donna scrapped a great summary of 2016 with Recyclables 54. 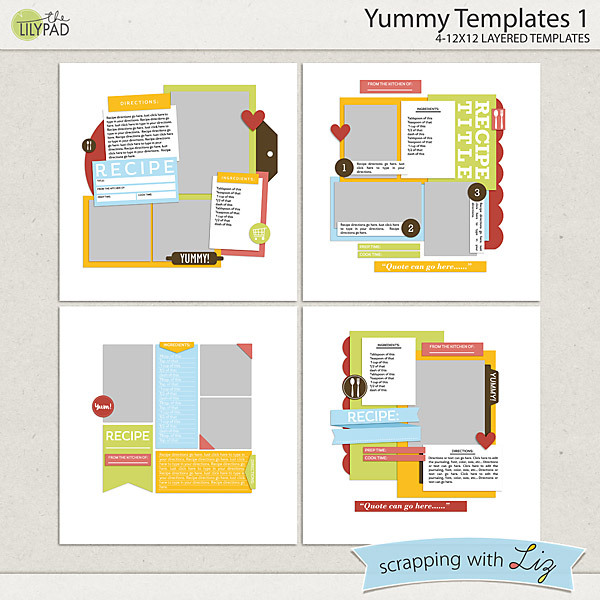 Tiffany used two templates in Focal Point Templates 3 to make a double page layout. Today's highlight is brought to you by Cindy. 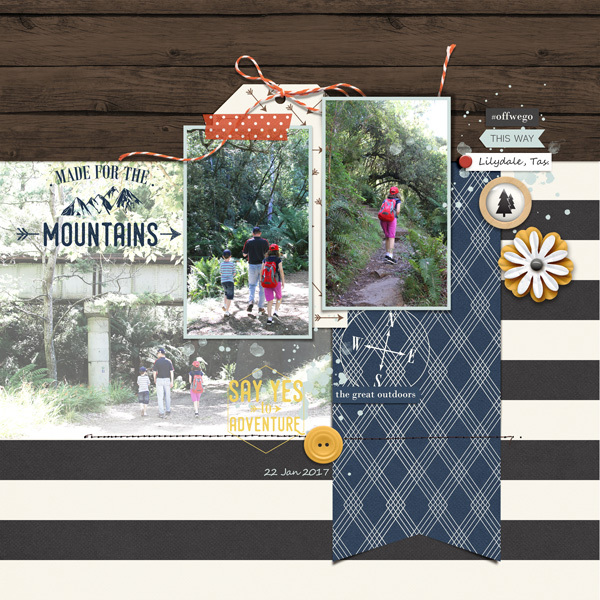 I love the fun elements Cindy put on this page to convey the feeling behind the photos. 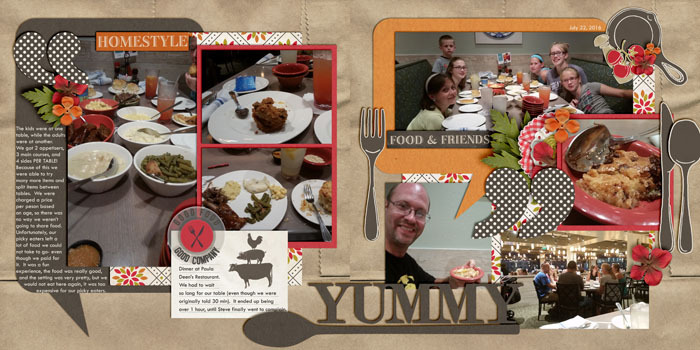 I also love the balance of stamps behind the photos with some pretty clustering on top of the photos. 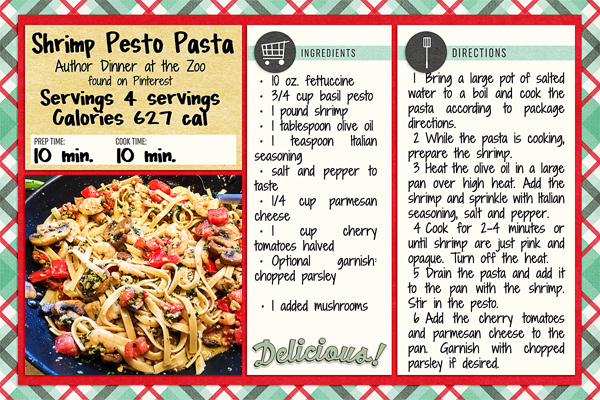 It's a fun double pager! 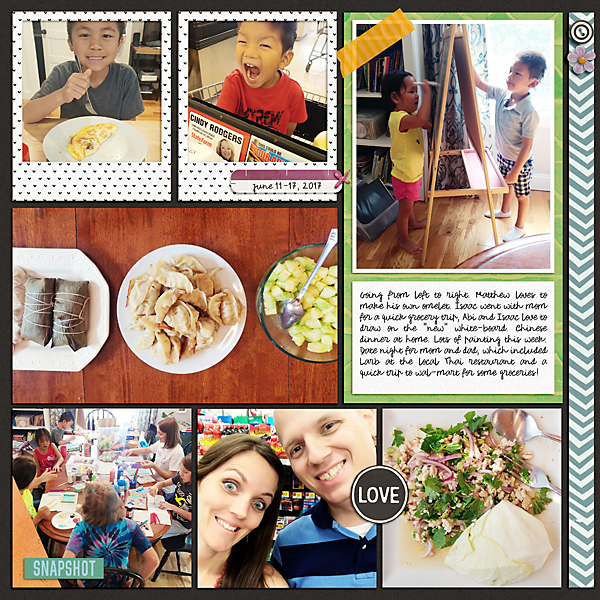 Share your pages here for a chance to be highlighted on the blog and win a coupon to my store! 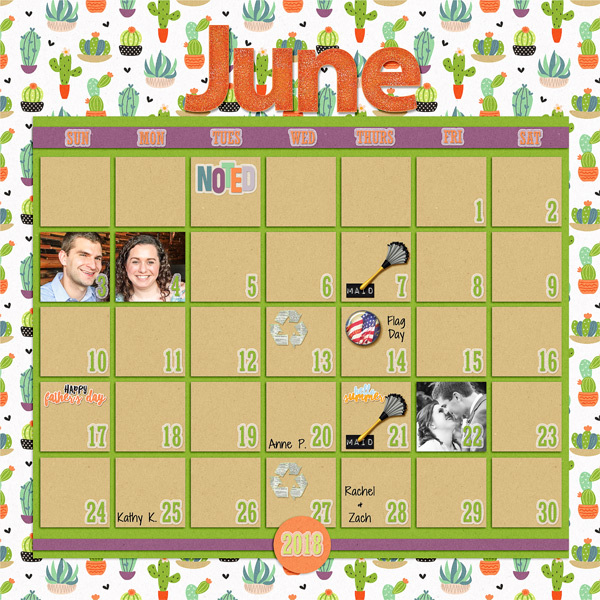 As we near the end of June it's time to check in on our projects! 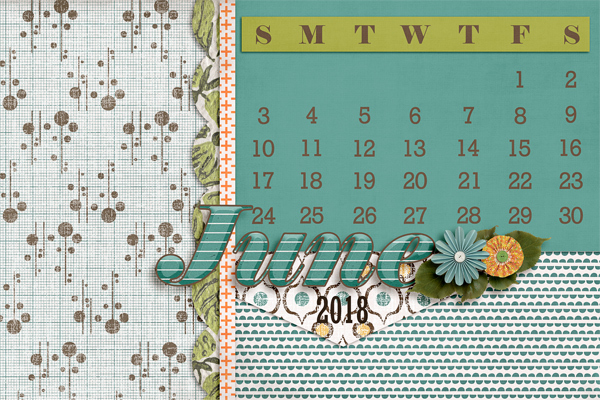 I know that around this time of the year, you can really start to see those projects coming together, with several monthly spreads or calendar toppers made, or even more weekly pages finished. Your albums will be cherished! 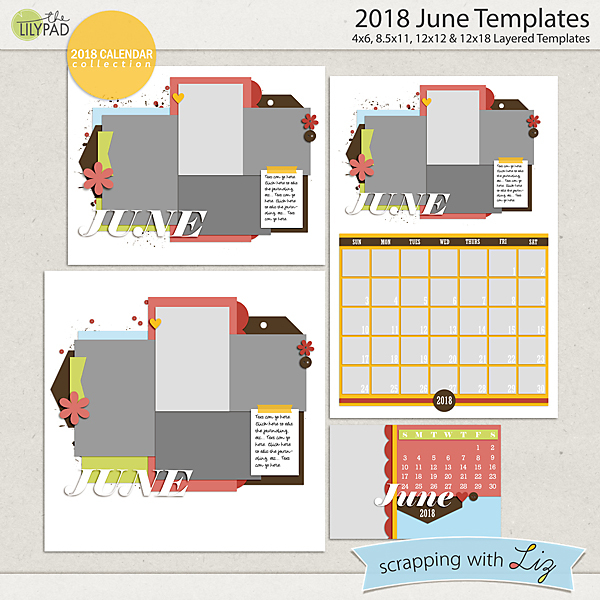 Liz has some new templates for us, great for keeping us on track with our albums or to use as a stash to pull from even if we aren't working on an album project. 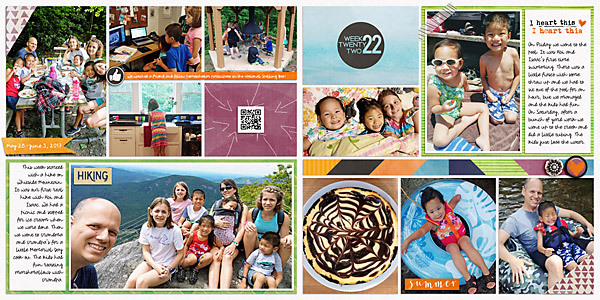 These new products are 20% off through June 25th, 2017. 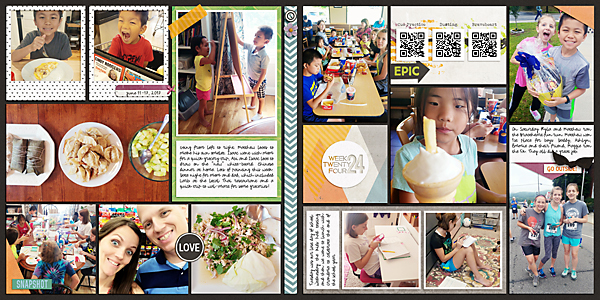 I think it will just be easiest if I share the journaling right from my page. Going from left to right. 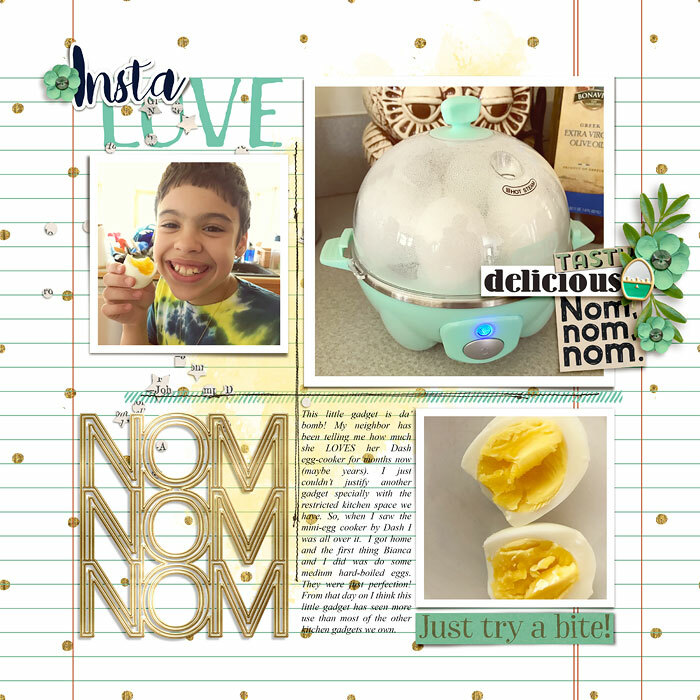 Matthew loves to make his own omelet. Isaac went with mom for a quick grocery trip, Abi and Isaac love to draw on the "new" white-board. Chinese dinner at home. Lots of painting this week. 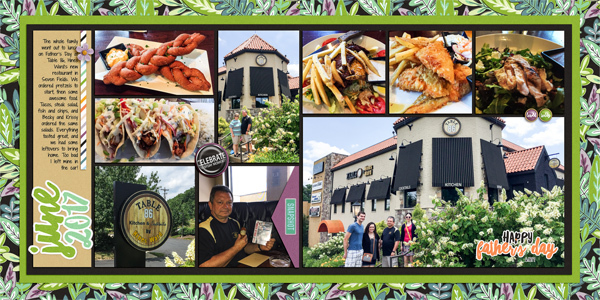 Date night for mom and dad, which included Larb at the local Thai restaurant and a quick trip to Wal-mart for some groceries! Tuesday was our last day of school. 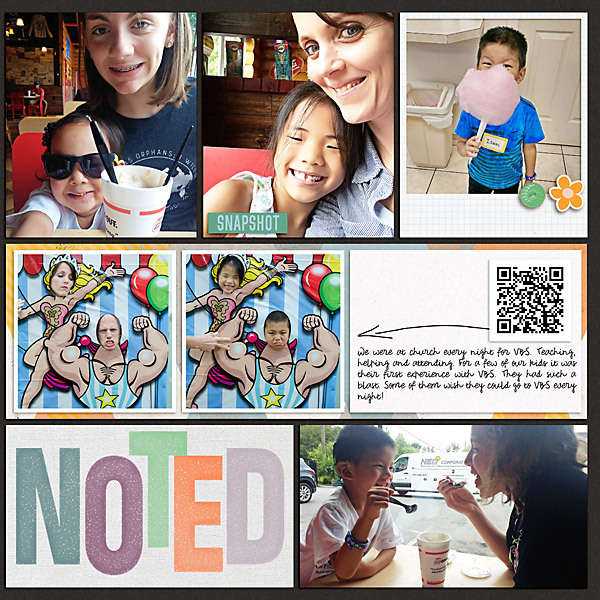 Wednesday the kids had testing and then we went to lunch with Grandma to celebrate the end of the school year. On Saturday Kyla and Matthew ran the Braveheart fun run. Matthew won 1st place for boys. Daddy, Ashlyn, Emmie and their friend, Maggie ran the 5k. They all did a great job. That's it for this week. 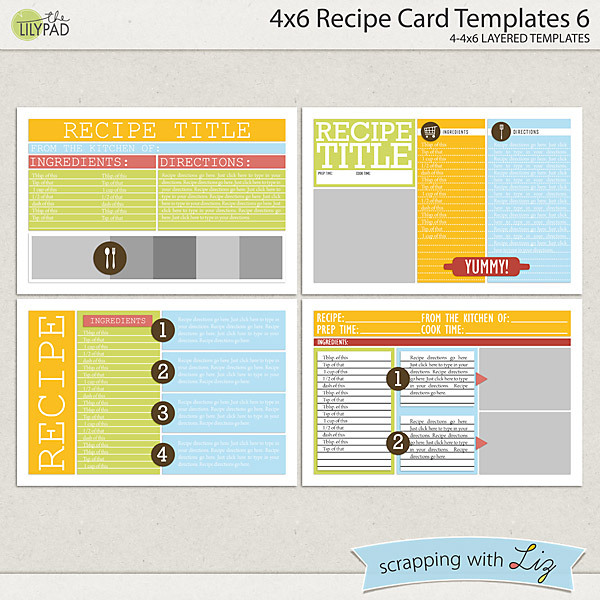 Are you keeping up with your scrapping goals? 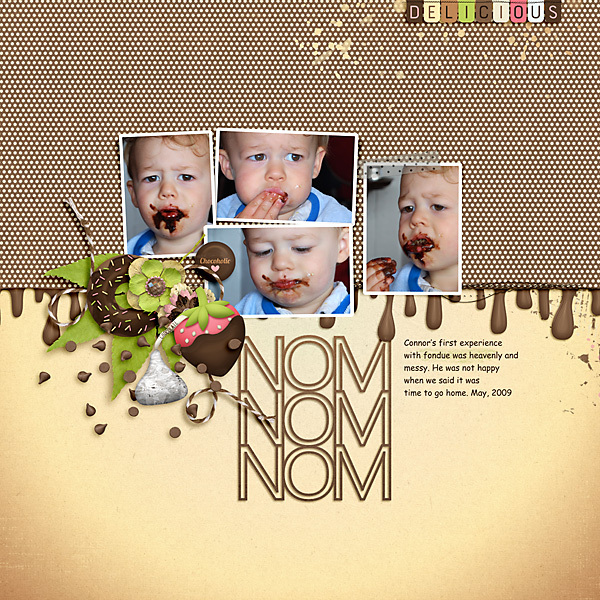 I instantly fell in love with this page when I saw it in the SwL Gallery. I love her clustering. I especially love the repeated patterned paper on the top and bottom of the page. 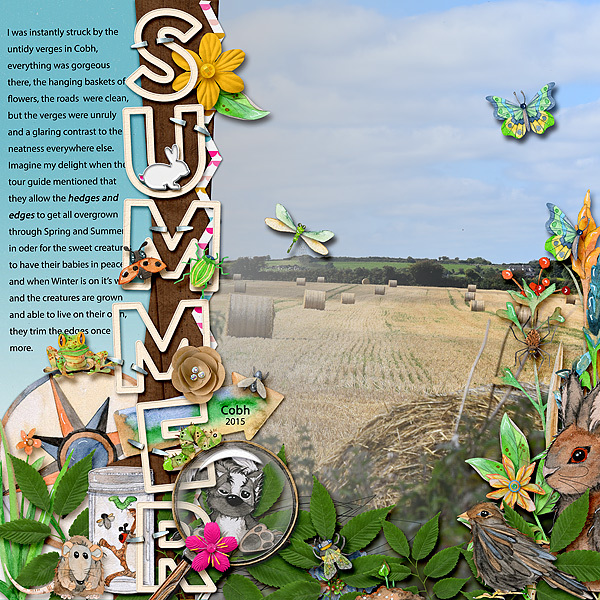 Even though there is a lot going on on this page it all comes together nicely. Great job Alyna! 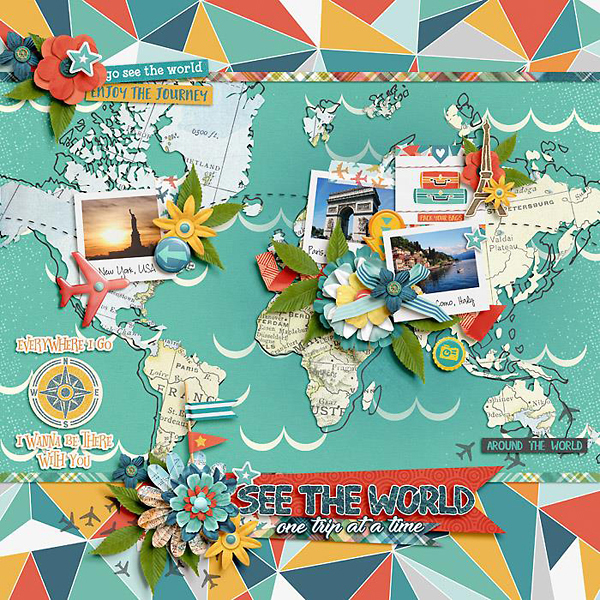 Make sure to share your pages in my group. I love looking at them each week! 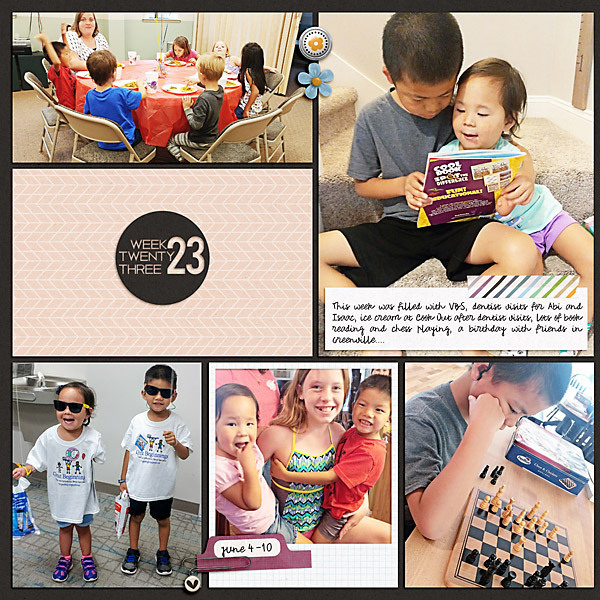 Week 23 was mostly about VBS (Vacation Bible School). 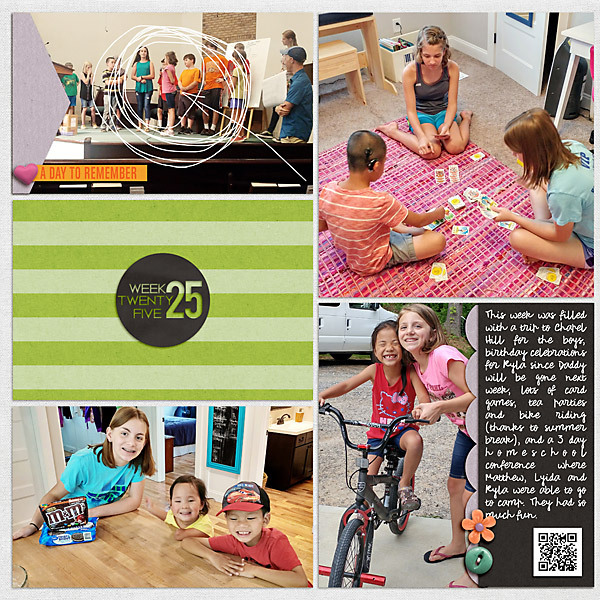 We were at church every night teaching, learning and having fun. There was also dental visits for Abi and Isaac. They were so good and just too cute. Afterwards we went for shakes. Then there was a birthday party on Saturday. 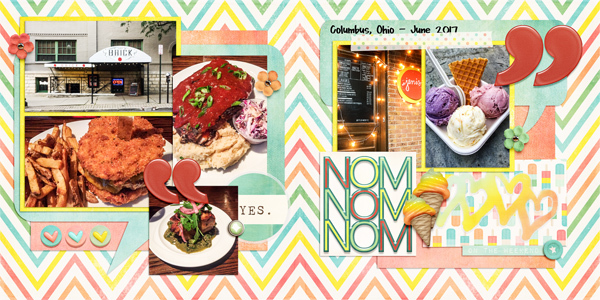 Today I have some older Weekly Life spreads on sale, and also some NEW foodie word-art (which is also a sneak peek of what I have coming on Friday!). Enjoy the 50% SOSN discount on these products today only, June 14, 2017. 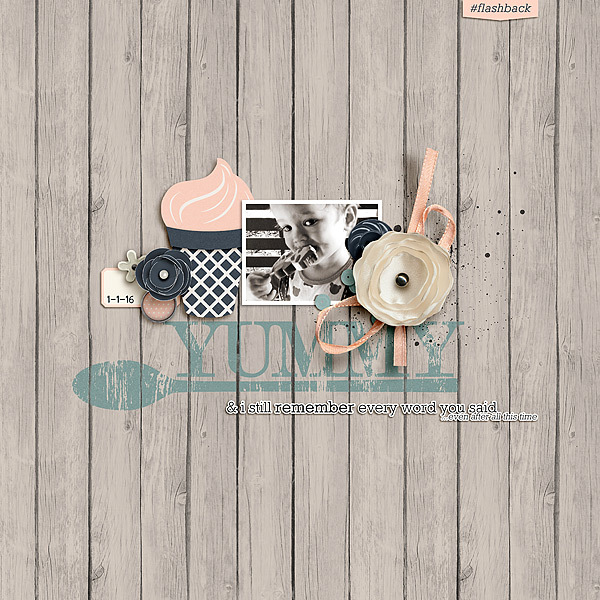 My team all used the Yummy! 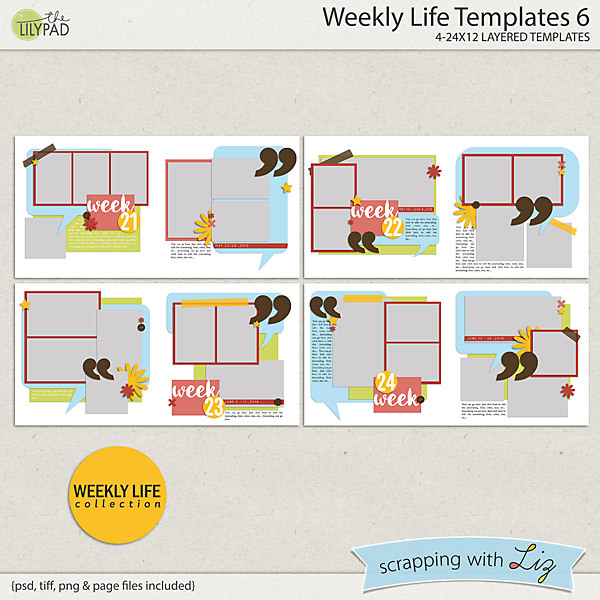 - Cut Outs as titles on their pages using Weekly Life Templates 6! 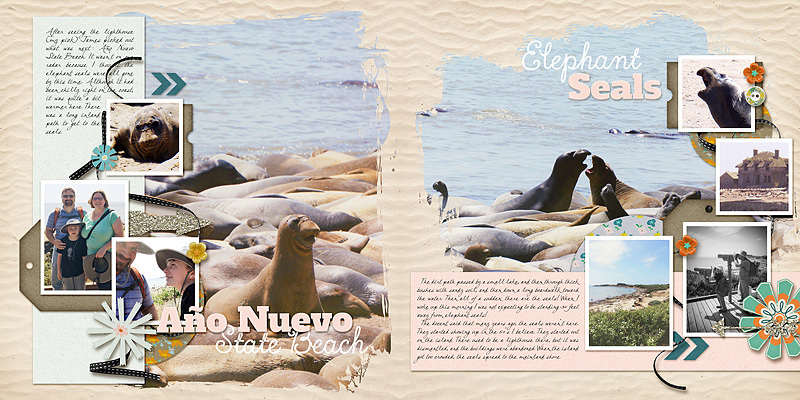 Here are pages from Ophie, Dawn, and Donna. 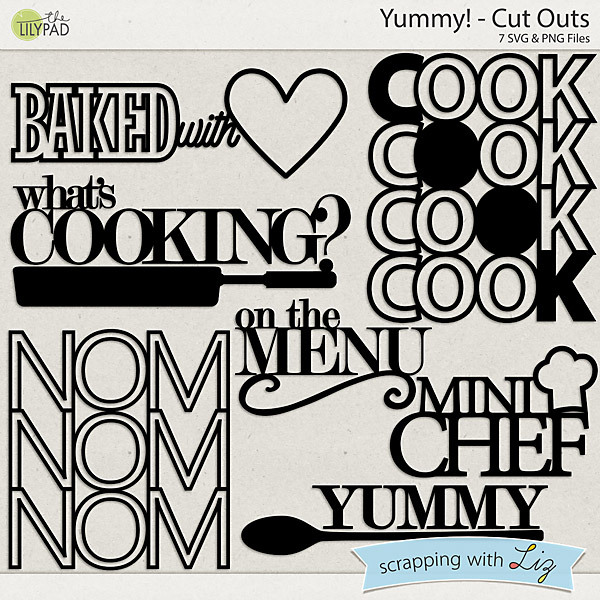 And some of the TLP Creative Team Members scrapped these pages using the new Yummy Cut Outs. Today I'm going to just copy and paste the journaling from my pages because my brain is too scattered to write anything new. That's what 7 kids will do to you! 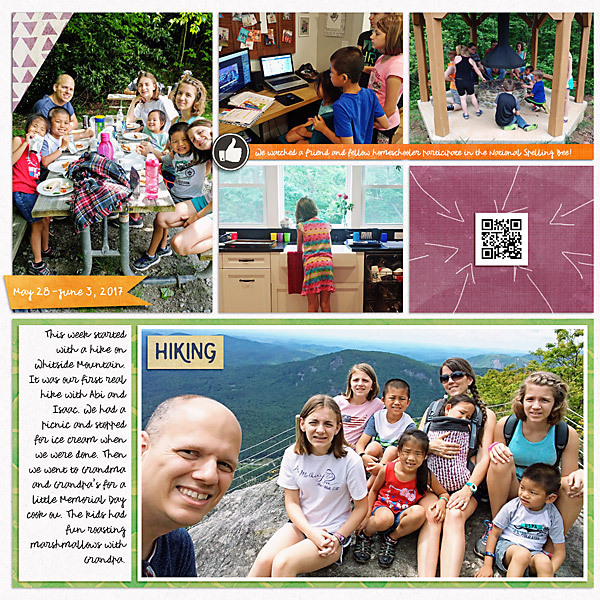 This week started with a hike on Whiteside Mountain. It was our first real hike with Abi and Isaac. 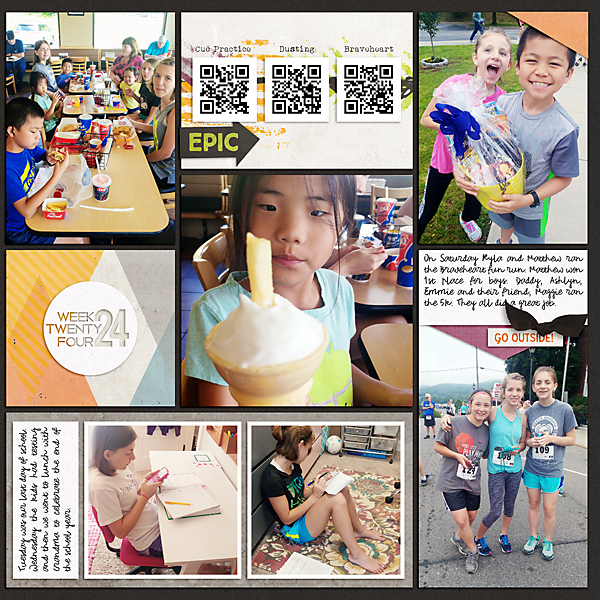 We had a picnic and stopped for ice cream when we were done. Then we went to Grandma and Grandpa's for a little Memorial Day cook out. The kids had fun roasting marshmallows with Grandpa. 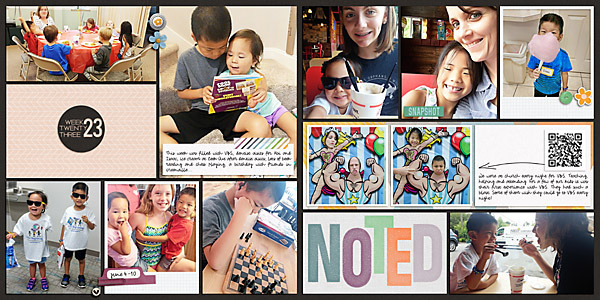 We watched a friend and fellow homeschooler participate in the National Spelling Bee! On Friday we went to the pool. 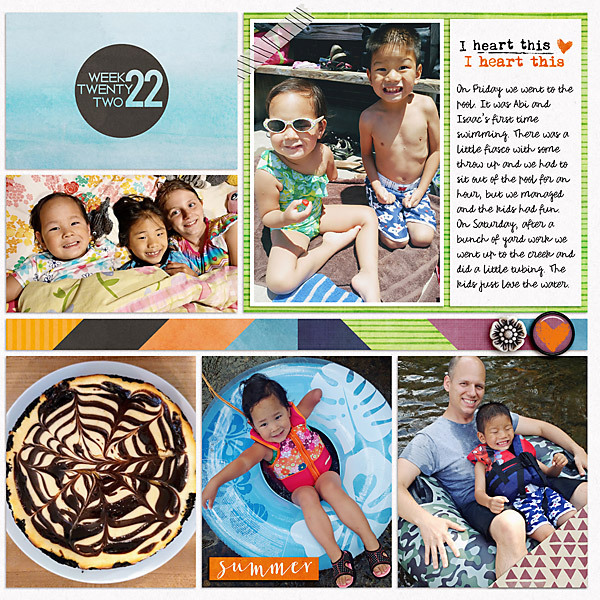 It was Abi and Isaac's first time swimming. There was a little fiasco with some throw up and we had to sit out of the pool for an hour, but we managed and the kids had fun. On Saturday, after a bunch of yard work we went up to the creek and did a little tubing. The kids just love the water. That's it for Week 22. It was a blast. 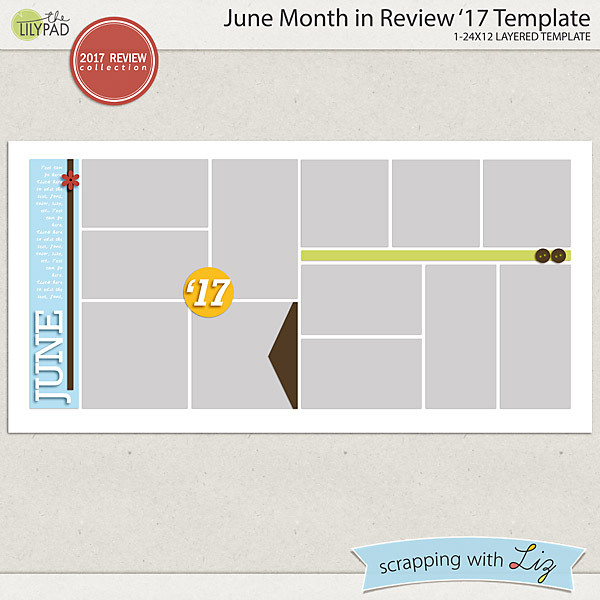 Today I have two different types of monthly review templates on sale. Enjoy the 50% SOSN discount on these products today only, June 7, 2017. 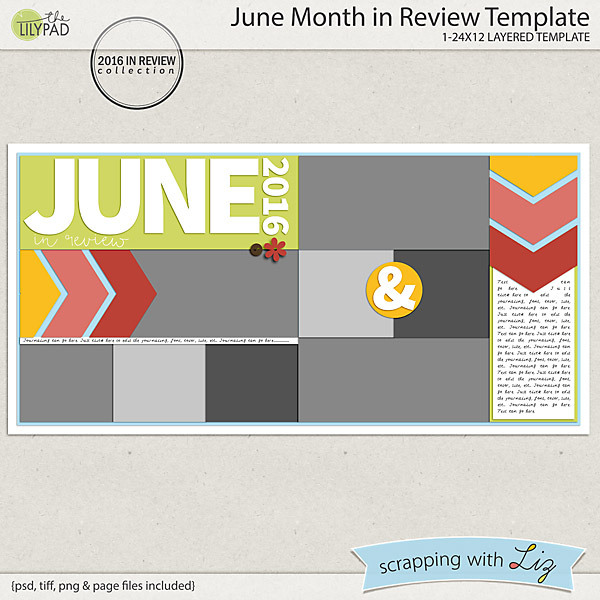 June Month in Review Template is a great double-page spread for scrapping an overall look at your month, or for scrapping an event with several supporting photos. 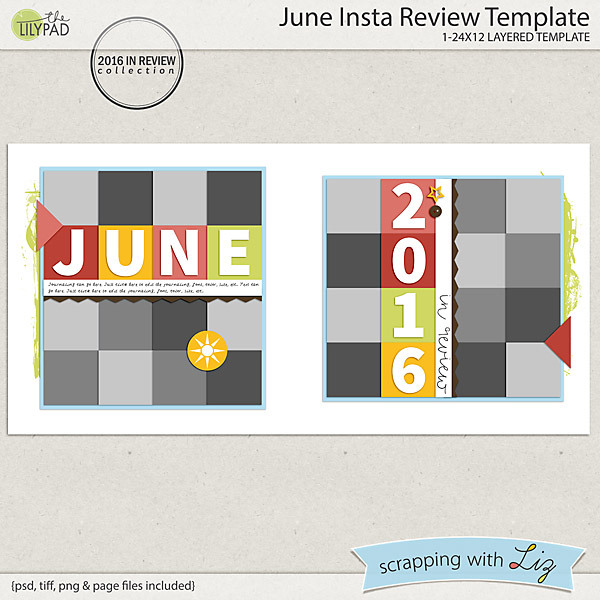 June Insta Review Template is another 2-pager with 24 small square photo spots. 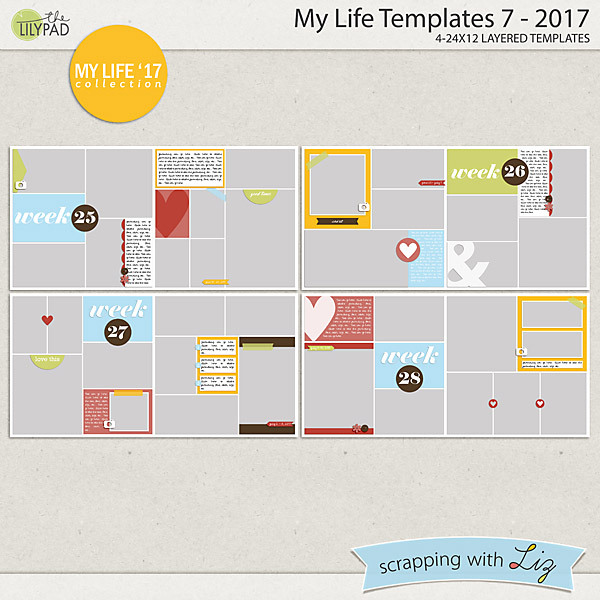 Great for scrapping a lot of different snapshots on a single page, especially your fun and quirky Instagram style shots. 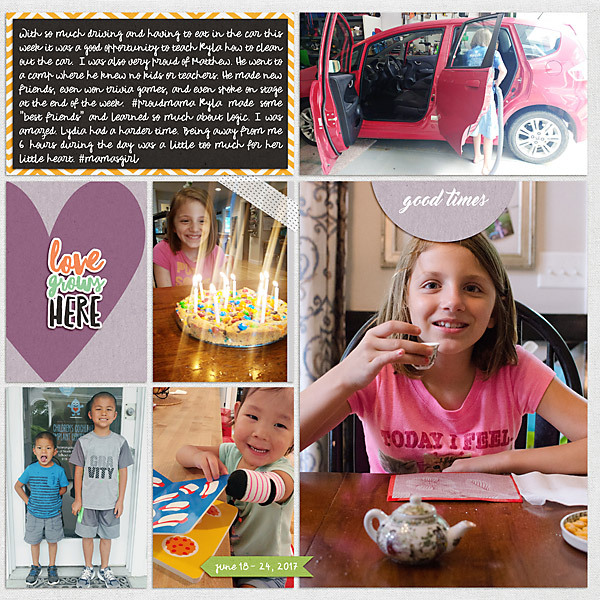 Rebecca's photos and journaling hit the highlights of her month. 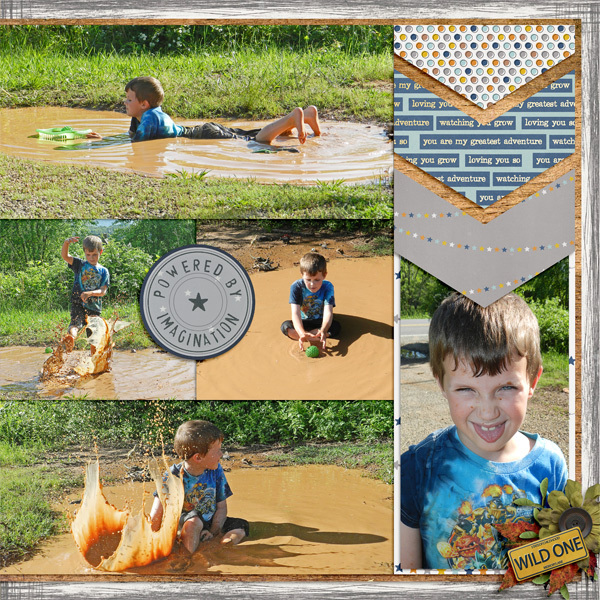 Christine used one half of the monthly review page to collect several actions shots of her kiddo playing in the mud.